Payroll Time Clock Options | Human Resources Inc.
Time clocks can be a relatively easy to set up for your business. Everything from a simple keypad entry to biometric readers, such as fingerprints, are now available and can be connected over the internet or telephone line. What’s more, timekeeping data can be fed directly into our payroll system. This reduces compensation errors and payroll preparation time significantly. It is easy to monitor remotely from your PC or smart phone for real time tracking purposes. This comes in particularly handy if your business has more than one location. Ideally suited for mid-sized companies, adopters of time clock systems are seeing substantial savings of time and money. This system’s flexibility allows modifications to fit the needs of companies of any size. It can track simple in and out, but also be programmed with more complex labor distribution and shift differentials. For example, if an employee is working for one client in the morning and another client in the afternoon, job codes can be calculated appropriately. Employees can clock in with a keypad, swipe card, or online if working remotely. It connects to the web or transmits via the telephone. You may also set rules for certain departments and rounding of minutes. It knows when employees are working overtime or on holidays so pay can be automatically tallied. Models: TimeClock 330/380. 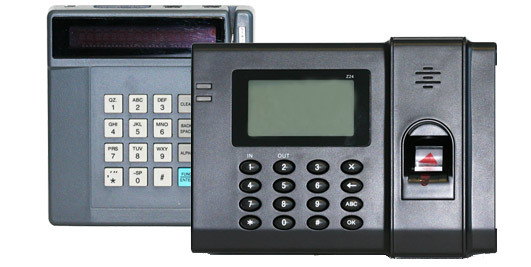 These series of time clock is ideal for businesses looking to combine biometric employee identification and near real-time data connection to the internet. This allows employers to view time card data or employee punches immediately for supervisory purposes. Punches are sent continuously throughout the day as employees clock in and out. If your business has employees that work off-site, then WebClock may be the solution. Telecommuters and other types of remote employees can clock in and out from anywhere there is an internet connection, including smart phones. Updates are made to the central server in real-time so supervisors can track punch-ins and punch-outs. Our electronic timekeeping solution is the perfect scalable solution for today’s growing enterprise. Contact us today to learn more about the right solution for your business!